As I wrote about in Why I Love Boston, one of my favorite things to do in Boston is wander around the city. Over the course of several years, after filling in dozens of mole skin notebooks packed with note-sketches and 1,000s of photos later I like to think that I have become an unofficial tour guide of the city. All of the history written about in this 1 Mile Walking Tour of Boston, has culminated from years of researching Boston, reading books, and sitting in lectures… if you find anything to be inaccurately stated, please let me know! I invite you to walk along the line of the map I provided, and you will get to see some interesting hidden streets and buildings along the way. By walking along the line I created, you will encounter many more sites along the way than I pinned on the map. Please let me know if I missed any of your favorite sites! Within the variety of locations I did select, I’m sure there is at least on building on here you never noticed, whether you have lived here all of your life, or never been to Boston. Some of the buildings are my favorite hidden structures, some are more “touristy” but all are rich in history and play an integral role in how Boston came to be the city it is today. You can print out the map, or use it on your smart phone. Using Safari to access Google Maps on your Android or iPhone will be the best way to follow the map on your phone. Start at Park Street T Station (Red and Green Lines). Park Street Church: Park Street Church was built in 1809 on Boston’s Old Granary site. The Old Granary was an old wooden building erected in 1737 to store wheat and food for the poor. King’s Chapel: In 1688 King’s Chapel was constructed on land seized from the neighboring cemetery. Due to the large Puritan population of Boston settlers, Royal Officials and military were the only people who used this chapel. This chapel also houses New England’s first organ. 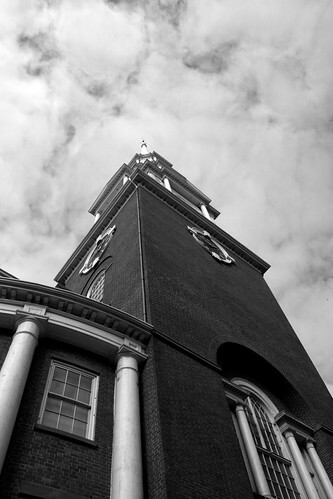 Old South Meeting House: The Old South Meeting house was a place of worship built in 1669. The meeting house was used for mass gatherings, and public meetings. Old State House: Built in 1713, the Old State House is Boston’s oldest public building. The State House was the capitol of the colonial British government. Site of the Boston Massacre: On March 5, 1770 the townspeople began throwing snowballs and rocks at the British soldiers in front of the Old State House. The soldiers feared their lives as the mob began closing in while waving clubs and threatening murder. One solider was hit with a stick, broke down and fired at their tormentors. The other soldiers followed, killing 5 people total. The first African American, Crispus Attucks was among them. Customs House: Head to the top of the Customs House for a fantastic view of the city. Open every day except for Fridays. Blackstone Block: Want to really brush elbows with history? Head to the very touristy, yet extremely fresh Union Oyster House. This restaurant opened its doors in 1826 making it the oldest continuously running restaurant in the United States. Try the clam chowder! This entry was posted in Downtown, Neighborhoods, Quickly Around Town, Things to Do and tagged architecture, boston, boston culture, downtown, freedom trail, history, perfect mile, walking tour by Alex Dupnik. Bookmark the permalink. Perfect tour Alex! I love the architecture and historical significance of the Chart House and Custom House Block on Long Wharf as well, and not to mention the view of the downtown skyline from the end of the Wharf is amazing. Thanks for the feedback! I plan on doing other 1 mile tours of the city… one along the waterfront would be a great walk!